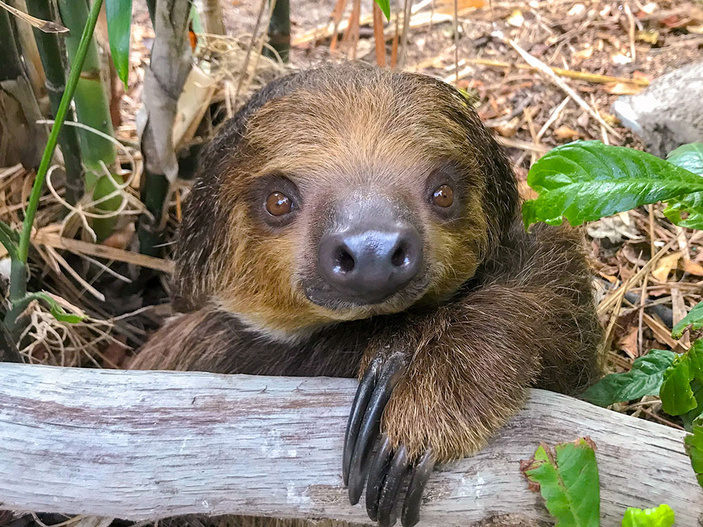 A young male sloth named Chico has joined the other animal residents of Caribbean Journey’s jungle at Texas State Aquarium. The immersive jungle in Caribbean Journey has an open-air design, allowing birds to fly freely throughout the exhibit. Dense trees and several waterfalls make visitors feel as if they are actually touring a living lowland forest. Throughout the exhibit, visitors are in close proximity to a wide range of wildlife, including stingrays, sharks, toucans, flamingos, and — of course — the sloths. Like the birds, the sloths are allowed free range throughout the jungle. According to the aquarium’s animal care staff, allowing the sloths to explore the space helps them stay healthy and happy while encouraging natural behaviors. Chico, a one-year-old Linnaeus’s two-toed sloth, joins Xena, who has been with the aquarium since Caribbean Journey made its debut in 2017. If circumstances are right, Xena and Chico could one day mate, aquarium officials said. Visitors shouldn’t expect a sloth romance anytime soon — it will be three to four more years before Chico reaches maturity. Texas State Aquarium is located at 2710 N. Shoreline Blvd. on North Beach in Corpus Christi. For more information, call (361) 881-1230 or (800) 477-GULF (4853). Visit the website at texasstateaquarium.org.